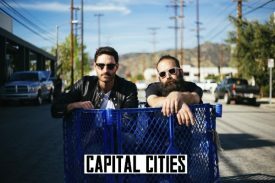 TAMPA, Fla./LAS VEGAS, Nev. (July 26, 2018) – The Rock ‘n’ Roll Marathon Series® is pleased to announce Capital Cities as this year’s headliner for the 2018 Toyota Rock ‘n’ Roll® Las Vegas Marathon & ½ Marathon. On Sunday, November 11, 2018, Capital Cities will take to the Toyota Rock ‘n’ Roll Concert Series headliner stage at 3:00 p.m. to kick off a special night when runners take to the Las Vegas Strip. With a brand-new start-line festival for runners and spectators just off the Strip on Harmon Ave., the Toyota Rock ‘n’ Roll Concert Series returns to its traditional time before the marathon and half marathon. The Los Angeles-based indie-electro band formed in 2010 and released their debut EP in 2011 giving them their breakout hit “Safe and Sound” that went Multi-Platinum. The song later served as the lead single from their debut studio album, In a Tidal Wave of Mystery, released in 2013. “Safe and Sound” earned MTV Video Music, Grammy and Billboard Music Award nominations while reaching #1 on the U.S. Alternative Songs Chart, #2 on the U.S. Rock Songs Chart, #1 on the German Media Control singles chart and peaked at #8 on the Billboard Hot 100. The band followed with successful subsequent singles including “Kangaroo Court” and “One Minute More” giving them three songs off their debut album to reach Top 50 in the charts. Showcasing the growth and popularity of their music, the group joined Katy Perry in 2014 on the North American leg of her Prismatic World Tour. With the success of their tours and festivals, the group was able to put their efforts back into creating music and released the EP Swimming Pool Summer in the summer of 2017. The band continues to pump out new music in anticipation of a brand-new studio album, Solarize, with the pre-release of all new singles. They put out “My Name Is Mars” this past March, released “Venus & River” on July 13 and, most recently, “Levitate” on July 20. The band is led by the duo of Ryan Merchant on vocals, keyboard and guitar, and Sebu Simonian on vocals and keyboard, and are joined by band members Manny Quintero on bass guitar, Spencer Ludwig on trumpet, Nick Merwin on guitar and Channing Holmes on drums. Their studio album is expected to be released later this year. Earlier this year, the Toyota Rock ‘n’ Roll Las Vegas Marathon & ½ Marathon announced an all-new course for the 2018 event. The marathon and half marathon will now commence on the heart of Las Vegas Blvd. near MGM Grand Las Vegas at 4:30 p.m. giving participants a one-of-a-kind nighttime running experience by taking them down closed lanes of Las Vegas Blvd. and past iconic Vegas sights. From the new start line, the course will go south and around the ‘Welcome to Las Vegas’ sign then go north past the Bellagio Fountains, up to Fremont St. and through downtown Las Vegas before finishing in front of an erupting volcano at the Mirage Hotel & Casino. Race weekend kicks off with a Health & Fitness Expo on Thursday, Nov. 8 from 3:00 p.m. – 6:00 p.m., Friday, Nov. 9 from 11:00 a.m. – 7:00 a.m. and Saturday, Nov. 10 from 9:00 a.m. – 6:00 p.m. at the Las Vegas Convention Center. The expo will showcase vendors featuring the latest in running gear, nutrition and training, and is free and open to the public. For more information or to register for the Toyota Rock ‘n’ Roll Las Vegas Marathon & ½ Marathon, visit RunRocknRoll.com/Las-Vegas. For more information on the Rock ‘n’ Roll Marathon Series, please visit www.RunRocknRoll.com. Media may contact press@runrocknroll.com.